They say dogs are a man's best friend. I concur. 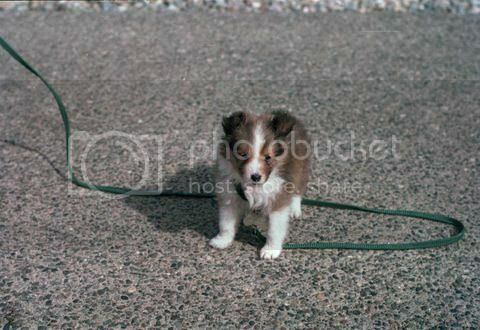 Though Sneakers never reciprocated his affection for me which I so ardently wish he had (I was the one who begged and pleaded and begged some more to get a dog in the first place!!! 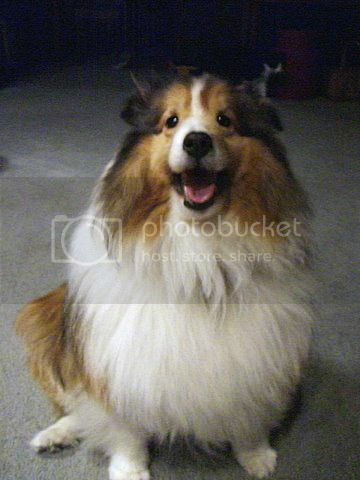 ), he was still the unofficial 6th member of our family for the past 13 wonderful and fun-filled years. me: What time is the deed being done? me: Super sad. It's almost worse having to be there when it happens I think. dald: I know. I'm going to tickle his tummy until the end. dald: I hope we get our pets back in heaven, that's all I can say. I'm going to have a looooooooot of pets in heaven. I asked Chris if we get to pick and choose, cuz there are some pets I'd like to have for time and all eternity more than others. He said he's sure it'll all work out. I believe him. "We are all so completely sad. Eric wept. Allie wept. Dald clutched at his chest like he was having a heart attack. He said he felt like his heart was breaking. It was the hardest thing I have ever had to do in my life. I want Sneakers to contact me from doggie heaven to tell me he's okay." 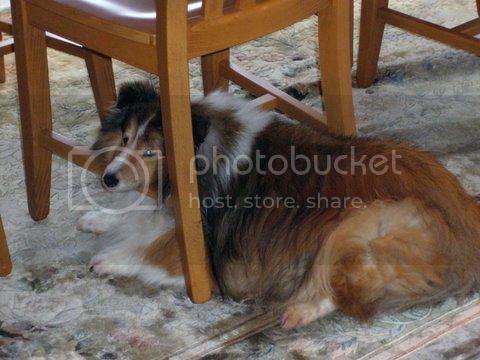 Malm - I'm sure he's running around chasing lawnmowers, barking at doorbells ringing, and loving having his hearing back. I'm sure he's one happy dog. Was he really ever that little? Teenage dogs aren't the cutest are they? They're gangly and awkwardly proportioned. But still. Sneaks is pretty cute. 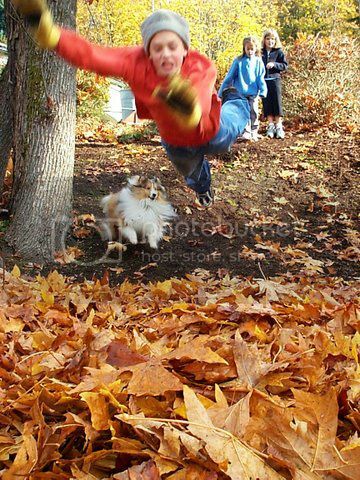 Love this action shot of Eric jumping into the leaves and his best friend not far behind. Pretty much the only picture I have of just me and Sneakers. 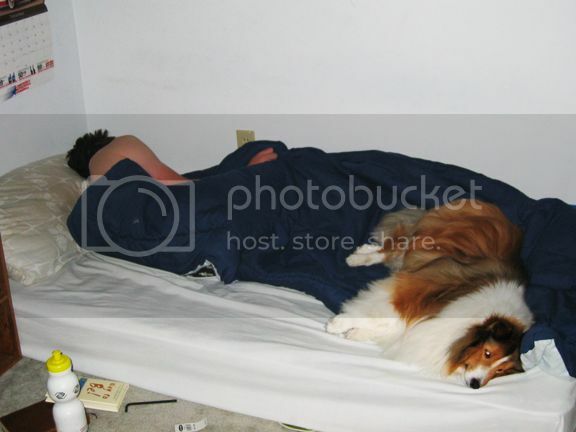 I remember every morning while still living at home, I would hear a "scrape scrape scrape" on Eric's door and he would open it and let Sneaks come in to sleep with him until Eric woke up. Sneakers would never harm a fly. He loved other animals and would lick them like they were his own pups. 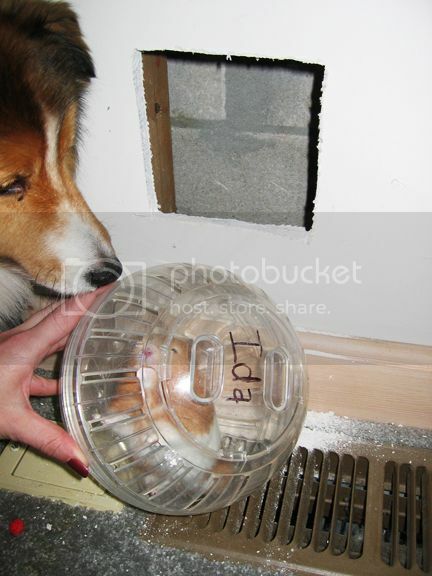 This is shortly after my dad cut a hole in the wall where we heard funny noises and it turned out to be Allie's hamster Ida. Proof that my dad has a soft spot for animals. He cut a hole in the wall! 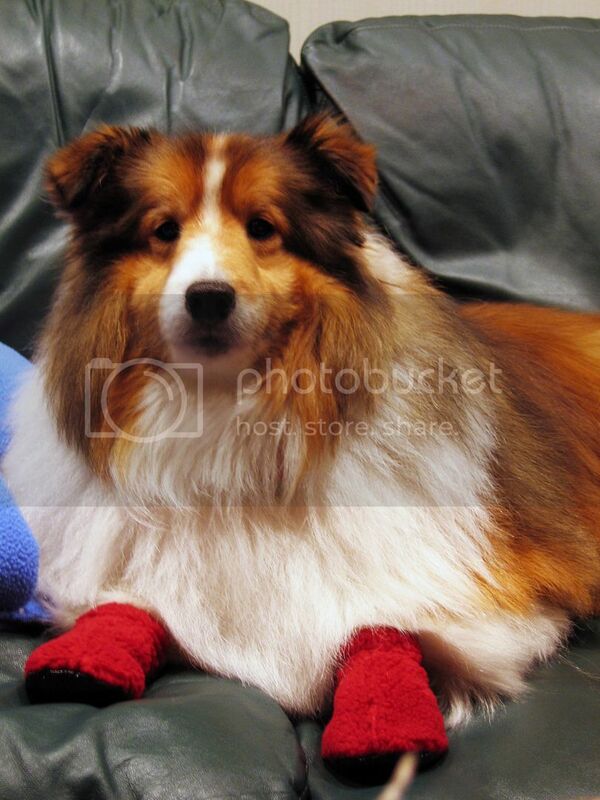 These red booties lasted about as long as it took to get this picture! Happy dog! Seriously, it looks like he's smiling! This was one of his favorite spots. 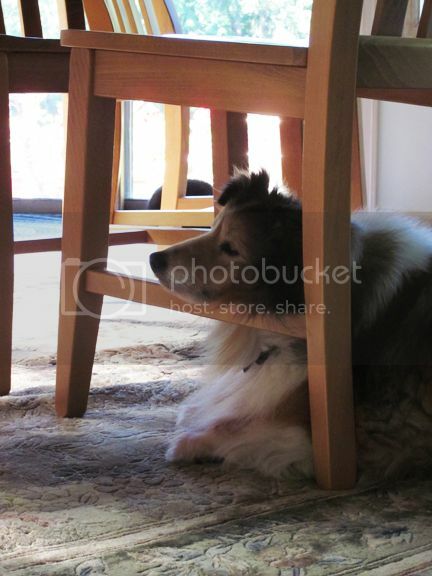 He loved to sit under this kitchen table chair and rest his chin on the rungs. 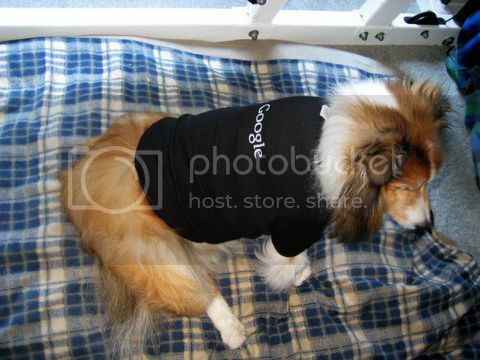 Bring your dog to work day at Google. Sneakers didn't last very long before he started barking. But he did get this awesome sweater! 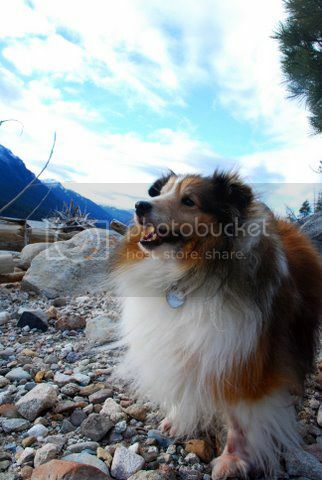 Just a pretty picture of Sneakers out in nature. Probably my favorite picture of Sneakers ever. Almost exactly one year ago. This is the last picture I took of Sneakers - in his favorite spot. It's such a new picture that it's still in my "to sort" folder, meaning I haven't uploaded it to Picasa and placed it into the "Pictures-Animals-Sneakers" folder. I'm so glad I got to go home to Washington just a few weeks ago, if only to say good-bye to Sneakers. Yesterday the neighbor boys, Eric, Tanya, and Allison helped dig a grave for Sneakers. My mom says they're going to put his doggie bed in first, then Sneaks, then the green blankie he always sat on when they took him up to Lake Wenatchee. We love you and we miss you Sneakers. This makes me sad : ( I sure hope sneakers and koko are in doggy heaven together!!! Im crying as i read your post and typing this comment. I have a dog right now named cece.... im 28 and we got him 2years ago. he is my first dog ever. i never understood the human...dog relationship till cece came along. now i dont know what i would do if we ever lose him. 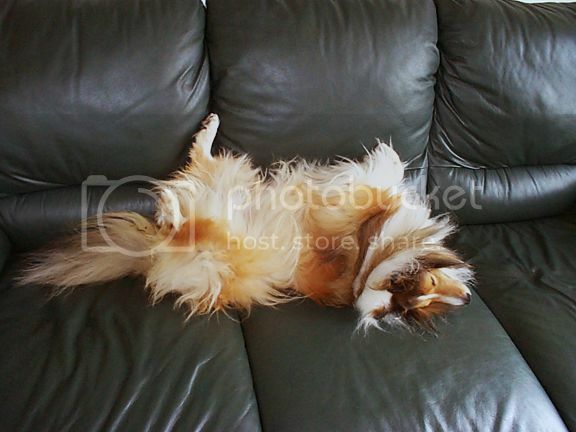 im sure sneakers is in doggie heaven where they all go. and he loves your family very much. dogs are so special and bring so much joy into our lives. I only have really great memories of Sneakers. He was the sweetest dog ever. Sneakers loved you, Paige, just like he loved the rest of us. I'm sure of that! I miss him! Great tribute, Paige. I almost busted out a tear here at work. I kept looking for Sneakers on the bedroom floor this morning in his usual place. 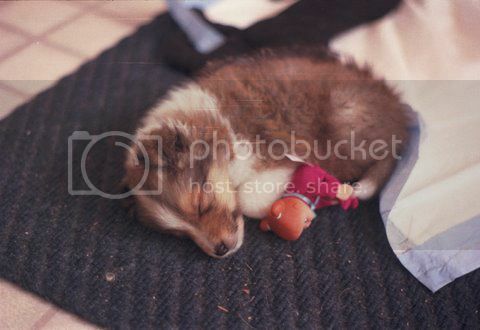 Our family dog, Bridgette, I got her when I was five, and she died when I was 19. She died in our arms, my mom and me. That was 8.5 years ago... I still have a hard time thinking about her. I'm so sorry to hear about Sneakers. I can't imagine being there for his last breath. So glad you got to see him one last time. Your dads statement of tickling his belly brought me to tears as well. What a great memorializing blog posting for him. I still remember when you guys first brought him home. He was loved and will be missed. My sympathies for Sneakers. I'm sure you did the right thing so he didn't suffer. I firmly believe we'll get to see our pets again someday... I'm counting on it! awww. i'm so sorry. losing a pet is so sad, and sneakers was WAY cute. 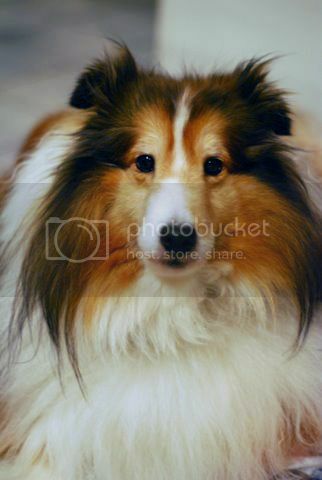 my family had a collie for years and years...she died when i was a freshman in college and we were all devastated. i am terribly sorry to hear about the passing of sneakers. there is nothing like the love from a pet...so true and unwavering. my dog hopper passed on july 8th and my life has changed 110%. i miss him every moment, but trust that i will see his sweet face again one day! my thoughts are with you & your family! This was so hard to read at work without crying. I'm so sorry for your family's loss. I have 3 dogs & I don't know what I would do without them. I always pray they'll live to be 20+ at least ;) I definitely believe all animals go to heaven too! Oh my - I'm bawling over at this end of the computer, Paige! BIG hugs to you and your family. I have lots a few beloved pets in my lifetime too and when my sweet dog Maggie dies, well - let's just say I'm going to fall apart. She's my sidekick and my sweet little buddy. I believe she truly saved my life. I'm so sorry for you and your family's loss. I'm thinking of you and sending BIG hugs your way! I'm so sorry to hear that, Paige. 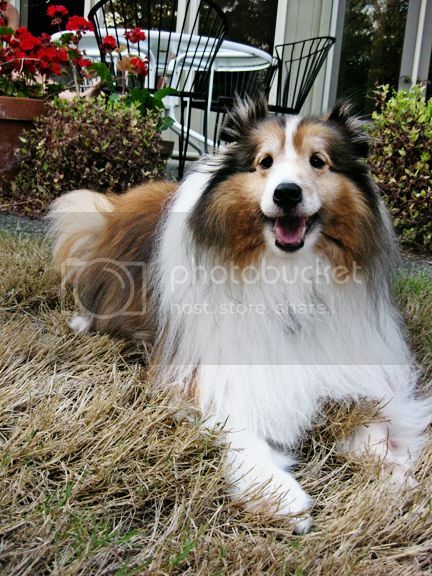 But he was such a beautiful dog!! Love all the pictures! awww Paige. I am so sorry, not sure if it is the pregnancy hormones but I have tears streaming down my face. He was a gorgeous dog. Take Care. Oh Paige, how heartbreaking. As a dog lover, I can only imagine the pain your family is feeling. Dogs really are family members. RIP Sneakers. 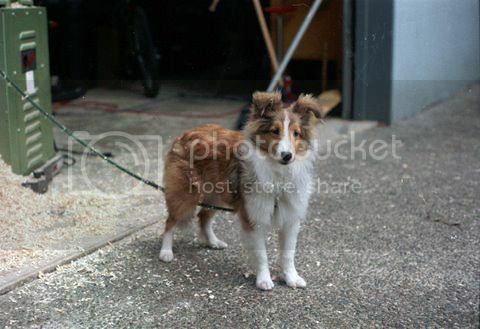 Aww, Sneakers was so beautiful!! We are looking to get a dog, and I think I may know what kind to get now! I'm so very sorry for your loss. It is never easy to let a pet go. They are family too. Sending hugs your way!